A couple of weeks ago, I wrote a post on how the HIV decides the site of DNA integration- the hiding spot. That's from a cellular point of view. There has also been a lot of debate on what is the preferential site of HIV to sit down in the body as a whole? The predominant view is mucosal regions. There are a series of studies that has been done over the past years to determine the answer. The latest buzz is all about a technique called ImmunoPET that has given a "seeing is believing perspective". Studies are available in context with presence of HIV copies in different organs. HIV is known to be present in a variety of organs and recent papers indicate that the nervous system which was previously thought of as a complication, is infected much earlier. I have not been able to specifically locate a paper that has studied HIV viral load in a variety of tissues in an HIV infected patient group, allowing for a comparison of dynamics. Before I go a little further, let me explain what a PET scanning actually is. PET stands for Positron emission tomography. PET is basically a labelled 3D high resolution imaging method. The method uses a labelled radio-tracer such as FDG (fluorodeoxyglucose) is tagged to glucose, which emits positrons. In cancer imaging studies, the cancer cells preferentially take high quantities of glucose which allows concentration of tracer. The energy emitted by the tracer in the form of positrons, is detected by the machine which generates an image. The trick is designing a tracer according to what you are looking for. 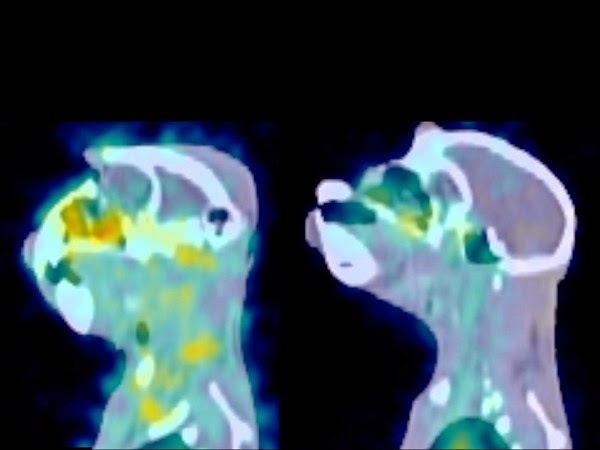 One of the earliest use of PET scans for studying HIV was by David Schwartz etal (2003), where they showed that HIV replication was heavily correlated with lymph node activity on the PET signal. This was more so important in lymph nodes of upper torso and neck regions. Photo 1: PET scan from Head region. The new study used an Immuno labelled PET scanning method for studying the distribution of SIV in a monkey model. The monoclonal antibody 7D3 which has good env binding properties was used for the study. PEG-DOTA-7D3 was the radiolabel used in the study. 12 monkey models chronically infected with SIV were given the radiolabelled antibody, thus attaching to places where SIV was sitting. Subsequent whole body PET scan lighted up the area where these virus where hiding. Photo 2: PET scan results. The method was repeated in monkeys after they received ART therapy and loads were confirmed using RT-PCR. Photo 1, shows the imaging pattern of SIV virus shows how the pathogen (yellow) in an infected monkey (left) declines after it receives antiretroviral drugs. The study showed (just as expected) that levels were high in gut and lymph nodes. But the startling finding was the levels in the upper respiratory mucosal regions. Further the levels were more than expected in genital regions. As Villinger puts it, “The epididymis of the monkeys are just lighting up, It’s mind-boggling”. The second part of the experiment is to compare where the viral load is after treatment. The imaging clearly shows sites where virus is still out there. For example in Photo 1, you could still make out yellow dots in the treated monkey. These findings have very broad implications for future designs. Oh yes, this whole study is in a SIV- monkey model. But then there is no reason why this is not similar to human condition. A more important part is this technique can be extended for other infectious diseases, where we need similar data. Seeing is believing. I want to end this discussion with a couple of lines from science. There is an expression of disappointment in where it has been published, and people agree that its should have been in Nature, not nature methods. Villinger says Nature reviewed and rejected the paper after a great deal of back-and-forth. But does it really matter? The data is finally out there.